John Beauprez Wins Event #4: $1,500 No-Limit Hold'em (Six Handed) ($324,764)! The fourth gold bracelet winner of the 2013 World Series of Poker has officially been crowned. After 1,069 entries and three long days of poker, it was John Beauprez who was able to soar above the rest of the field to earn the gold WSOP bracelet and the $324,764 that accompanies it. Three day ago both professional poker players and amateurs alike ponied up the necessary $1,500 buy-in to participate in this event. With this being one of the few short-handed events offered at the WSOP, players brought their A-game and were eager to show off their six-max talents. With this being said, the action came fast and furious early on with most of the field seeing the rail by the end of 10 levels on the first day of play. A grand total of 117 players returned for Day 2 which was just nine places from the money. The bubble burst almost immediately in the day and each remaining player was guaranteed a WSOP cash under their belt. Players like Rob Salaburu, Ting Ho, Bryan Piccioli, Jonathan Duhamel, Mark Smith, Shannon Shorr, Yevgeniy Timoshenko, Matt Salsberg, and Grant Hinkle were just some of those to walk away with a cash. By the end of the evening a final table of seven players was reached. The seven players took their seats in the ESPN mothership for the unofficial final table of seven. It only took thirteen hands for the final table bubble to pop, though, when Zohar Spivack five-bet all in for his tournament life holding . Spivack was called by Beauprez's and a run out of ensured we would have our official final table. A mere three hands into the official final table, Keven Stammen found himself engaged in a large confrontation with Beauprez. At 6,000/12,000/2,000, Stammen opened with a raise to 27,000 from the cutoff. Beauprez three-bet to 61,000 and action trickled back around to Stammen who four-bet all in for 308,000. The words barely left Stammen's lips when Beauprez shot out of his seat and announced a call. Stammen was in dire need to help but did not find it as the board came down . Stammen was eliminated in sixth place for $39,325. Mike Mustafa was the next player to see his tournament come to an end. His downfall came to fruition when he first doubled up Eric Blair. A mere five hands later, Blair found another double up through Mustafa, crippling him in the process. The next hand, Mustafa was all in for just a few blinds and called by three players. In the end it was Blair who put the nail in the coffin when he pocket sevens held up as the best hand during that checked down pot. Mustafa collected $56,499 for his fifth-place finish. All eyes were on 2009 World Series of Poker Main Event champion Joe Cada heading into the day but he remained fairly quiet at the final table. After a bit of four-handed play, he finally saw all of his chip in the middle before the flop while holding . Unfortunately for the world champion, he was up against Manig Loeser's . The flop came and flopped Cada stone dead. The meaningless and finished off the board and Cada was gone in fourth. Not long after Cada's elimination, Blair saw his tournament come to an end. At 15,000/30,000/5,000, Blair raised the button to 60,000. Beauprez three-bet from the small blind to 145,000 and Blair flat called to see the flop come down . Beauprez continued his aggression with a 170,000-chip bet. Blair announced that he was all in for 790,000 total, and Beauprez snapped him off. Beauprez was out in front and Blair needed to make something happen in order to stay alive at the final table. The on the turn was of no help, though, and neither was the on the river. 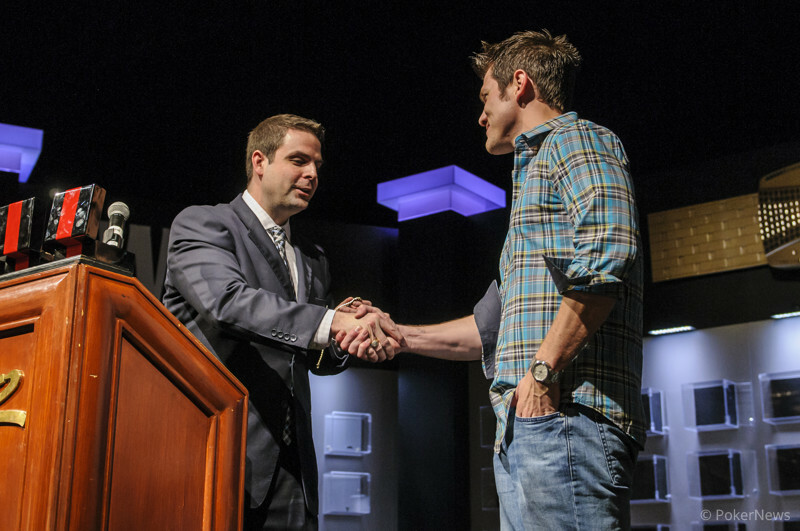 Blair became the third-place finisher and collected $127,300. Loeser and Beauprez were virtually even going into heads up and played tug-of-war for quite some time. After Loeser grasped the lead, Beauprez doubled back to even after winning a dramatic preflop all in race. From that point on, momentum was on Beauprez's side and he continued to wear Loeser down. On the 170th and final hand of the final table, Loeser had the button. At 25,000/50,000/5,000, he opened with a raise to 100,000. Beauprez three-bet to 230,000 and Loeser four-bet all in for 1.305 million. Beauprez heaved a sigh and called. Loeser was ahead but the flop came down , giving Beauprez the lead with his pair of eights. Loeser needed to improve in order to stay alive but it was not in the cards as the turned and the rivered. Just like that Loeser was eliminated and Beauprez was awarded the championship! 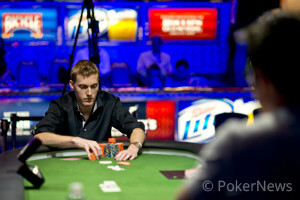 American John Beauprez captures the WSOP Gold Bracelet in event 04, beating Germany's Manig Loeser. Hand #170 Manig Loeser had the button. He raised to 100,000 and John Beauprez three-bet to 230,000. Loeser four-bet all in to 1.305 million and Beauprez called. Loeser looked primed to double up until the flop brought , pairing Beauprez's smaller card and vaulting him into the lead. The turned and Loeser needed to catch on the river in order to stay alive. 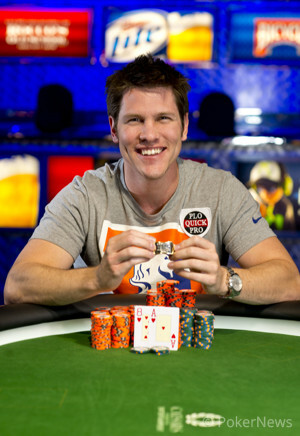 The was not the right card, however, and Loeser was eliminated in 2nd place, collecting $200,698 in prize money. Hand #165: Manig Loeser received a walk. Hand #166 & 167 Loeser raised to 100,000 and took it down. John Beauprez did the same the following hand. Hand #168: Loeser opened the button to 100,000 and Beauprez made it 230,000 to go. Loeser moved all in for about 1.355 million and Beauprez shot his cards at the muck. Hand #169: Beauprez raised to 100,000 and Loeser folded. Hand #162: Manig Loeser had the button. He made it 100,000 to go and John Beauprez called. The flop brought onto the felt and Beauprez checked, allowing Loeser to continue for 105,000. Beauprez came out with a check-raise, though, making it 245,000 to go. Loeser let it go and Beauprez took the pot. Hand #163: Loeser received a walk in the big blind. Hand #164: Loeser made it 100,000 from the button and Beauprez called. The flop was and both players checked. They did so once again on the turn and the finished off the community cards. Beauprez bet 115,000 which was enough to get Loeser to let his hand go. Hands 155-161: Each hand was either a walk or taken down with a min-raise from the button. Hand #153: John Beauprez had the button. He opened to 100,000 and Manig Loeser folded. Hand #154: Loeser raised to 100,000 from the button and Beauprez called. The flop brought and both competitors checked. The hit the turn and Beauprez checked again. Loeser fired 115,00 and Beauprez called. Fifth street was the and Beauprez decided to come out swinging for 195,000. Loeser wasted little time calling. Beauprez tabled for a heart flush and dragged in the pot.